Former resident of Louth, Lincolnshire, England. Graduate of Grimsby College of Technology and Arts with a degree in Computer Studies, now living in New England where living his dream as being a writer. One man's journey from the depths of despair to the peak of extacy as he unwittingly discovers a hidden message within a Leonardo Da Vinci work of art. 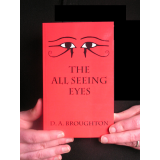 His quest takes him through several countries and several continents unlocking the secret messages of a hidden master. On the way he is joined by a female companion who brings out the best in him, whilst trying to avoid the clutches of an evil presence bent on doing them harm.